Are you serious? Is 4GB really not enough memory? Discussion in 'iMac' started by psykick5, May 27, 2012. I think I'm having way too many page outs, here. This is wrong. The computer has only been up for two days! No photoshop use, just chrome, mail, some Starcraft II, and some iTunes. This can't be right. Do you feel like your computer is too slow? If not, don't worry. Starcraft II will use lots of RAM, but I take you don't have to run any other demanding applications at the same time, do you? Well, it depends. For me 4GB is not enough. And apparently for you 4GB is not enough either. However, for a lot of people it is more than enough. It all depends on how you use your system and what you use it for. I don't do any gaming, but on days when I have to use VMware for any length of time I can expect to see 4GB-6GB of pages outs by the end of the day, which makes working on my 2008 iMac very painful. Just from your "my processes" I can see SC2 is using nearly one-half of the memory. How about changing to "all processes" and post the same activity monitor view. That will show us all the RAM hogs on your system. Bottom line, for what you are using your system for you would definitely benefit from more physical memory. Memory is cheap if you can upgrade. Depends on your system. What system are you running? You should quit Google Chrome and see if the page out numbers still increase. StarCraft II eats nearly half of your RAM here. Sorry this is a brand new base 21.5" mid-2011 iMac. It feels alright but it should feel much faster than my crap dual-core Celeron system IMHO. It runs SC2 well, though. 4gb is more than enough for the average user. If you need more ram. go buy some. It's not expensive. You have 1GB of inactive memory. So 4GB is enough. Some would argue that he has page outs, so he doesn't. Technically, he *is* getting slowdowns and therefore hasn't got enough memory. If he notices and cares enough to upgrade to 8GB is another question. Personally I have enough memory to ensure no page outs, ever, for max performance. Surely with 1GB inactive memory he could just use an app like this? Who says the page outs occurred when the screenshot was taken? More memory is always better. 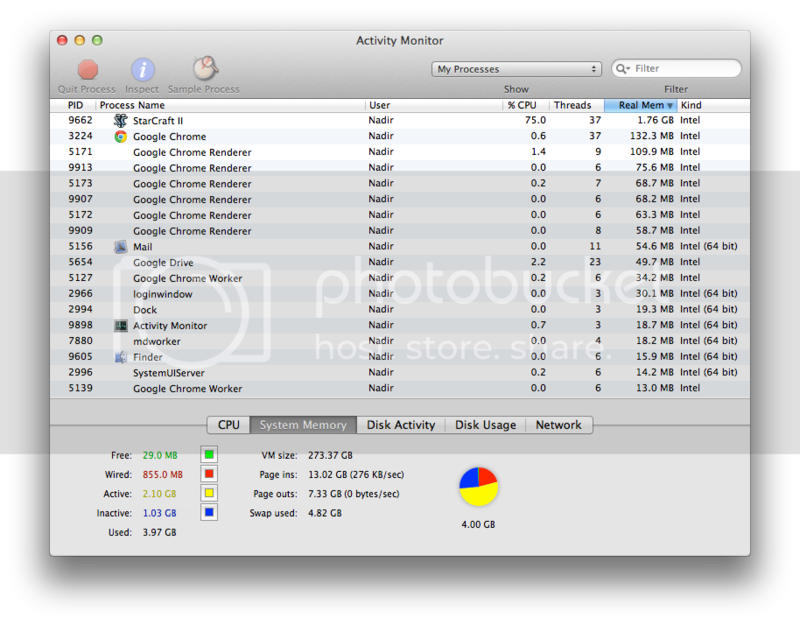 Macs have become memory hogs. I have 6 GB in my Mac Mini and if I could afford it I would go with 8 or more. No, the fancy new software people run hogs memory. OS X sitting here with Safari, Mail, iTunes and preview open is at 2.5GB. This will probably not be a popular comment but...OSX is just not a fast feeling OS. Try installing Windows 7 or 8 in boot camp and see how your system will fly. My 2011 iMac 27" Sandy Bridge quad can chug...on web pages. For me, 8 GB wasn't enough and doubling the RAM made a big difference. FWIW - I use programs that are RAM hogs. Well at the time you took this it's sitting on some inactive memory, but it could be lacking big enough chunks to work with. Overall Lion is somewhat ram hungry. Personally I think Apple should be shipping with 8GB standard given how cheap it's become. Memory flushing apps are 100% worthless. I wouldn't bother with them. 7GB page outs means not enough RAM. Sorry, thats what happens when you run the latest and greatest bloated OS. You could always go back to using a Mac Classic, 4MB of RAM was more than ample to run anything on it. Or you could take my old Centris 610, 68MB ram on it is like having a warehouse to park your car in. Ever since 10.4 OSX has been getting more and more bloated even though they claim its "simple". Well, I have Lion running on my old MacBook Pro with 4GB RAM, and its doing just fine, although I always have lots of stuff (like 30+ pages in Chrome and dozens of applications) open at all times. The monitor shows 60GB page/ins vs 10GB page outs. I don't notice any slowdowns. On the iMac I have installed additional memory because 4GB was obviously not enough to run two virtual machines at the same time. It kills me inside to see people actually buying that crap. They are useless and you can do the same thing with the Terminal. In fact, those apps will actually make your computer run slower. Great stuff. Since Lion, the kernel easily uses 1 GiB RAM. So yes, I'd say 4 GiB is not enough (anymore). My MBA runs ok with Lion with 4 GB of RAM, but the SSD has a lot to do with this. I found Snow Leopard painful with 4 GB and a mechanical hard drive on my old computer and had to upgrade. I would say 8 GB is the minimum these days. I am also unlucky enough to have to use a Windows 7 laptop for one of my clients occasionally. The previous one had 6 GB of RAM and a 2010 CPU (I couldn't be bothered to check which one). It wasn't great, but it was bearable. Unfortunately it was stolen by one of the TSA officials at San Diego airport when I left it in my hold baggage. I now have a brand new version of that laptop with a Sandy bridge CPU, but only 4 GB of RAM. It runs a lot worse than the previous one. I don't use it for "heavy duty" work - just a lot of documents (excel, word, powerpoint, visio) and MS Outlook. It's constantly spinning up for no discernible reason and is very clunky. I suspect though a lot of that has to do with the corporate stuff running in the background. The crux of the matter is that I don't think 4 GB is enough for a modern operating system, whether it's OSX or Windows. Of course, I am not including Linux since most variants run quite happily with a lot less memory. Computer hardware has far outpaced software that efficiency coding is simply no longer a priority. Sadly. Don't people say something like 'premature optimization kills little kittens'? It was only yesterday where I read a blog of some super-cool programmer boasting how he was writing his windows GUI application in assembler for better performance, and making some sort of crazy optimizations on his window creation code so it would require a hash lookup less  with the result that he had to spend a week with debugging that part, because on some machines it worked and on some it did not. You could say that the guy felt like a hero. In my eyes, he is an idiot. As much as I like my Macs, this is the harsh reality. Yes it can be right. Based on the data in the screenshot, 8GB would be at the edge of being enough for you. I would recommend based on the current memory prices that you get an 8GB memory upgrade (2x4GB). Chrome looks like it chews up an awful lot of memory across all the processes it spawns. Based on the almost 5GB of swap used, no 4GB is not enough. The inactive memory is used by the OS as disk buffers and will vary depending on what the machine is doing. Sadly, coding efficiency hasn't been a priority for a while. The priority has been new features for a lot of software companies. "Ignore the bugs, ignore the inefficient code, give the user shiny new features and they'll forget all the other issues."